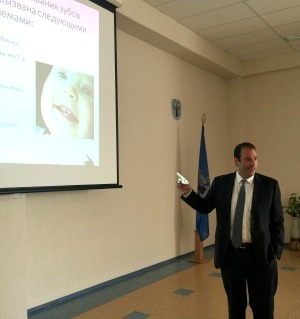 During the spring of 2015, I traveled to Minsk, Belarus as a Fulbright Specialist Scholar to conduct a project with my colleagues at the Belarusian State Medical University to improve the oral health of children. The intent of the project was to educate pediatricians on how to enhance the oral health literacy of their patients and their patient’s parents to reduce disease risk. Surprisingly, the dental school had never had an American faculty member visit the university, and both the faculty and the administration were thrilled to develop a collaboration. During my two-week project in Belarus, we conducted multiple trainings at pediatric polyclinics and at the university for pediatricians and medical students. Training pediatricians about oral health to help reduce disease disparities has been a recognized best practice for many years in the United States, however in Belarus, the concept has yet to be embraced. Pediatricians in Belarus, like their counterparts in the United States, have limited exposure to information about oral health, yet they are faced with dental questions on a daily basis from parents. The medical and dental communities’ receptiveness to my visit and lectures was tremendous, with little reluctance to participate in the programs. The university administration remained fully supportive throughout the project and are seeking further opportunities for me to return to Belarus to collaborate on improving oral health. To my surprise, pediatricians conduct home visits in Belarus, a practice long abandoned by pediatricians in the United States. On a daily basis pediatricians visit sick children in their homes, in order to reduce the arduous task of going to a medical facility and allow the child to remain in the comfort of their own home. When I explained that American pediatricians don’t practice in this way, the pediatricians in Belarus were shocked, exclaiming that they could not believe that we would force a sick child to travel to see the doctor. My hosts in Belarus were incredibly warm and welcoming from the very start. Prior to departing for Belarus, most of what I read described an isolated environment and a cold, official relationship between Belarus and the United States. In contrast to these descriptions, the dental and medical communities were thrilled to work with me, and overall I found people to be incredibly friendly and happy to meet an American. On my trip to the city of Mogilev in eastern Belarus, senior government officials requested to meet me to thank me for my work in their country. I have traveled around the world in various circumstances and have never felt safer than walking the streets of Minsk at night. Traveling to Minsk was also an ideal opportunity for me to reconnect with my family’s heritage. My family had originated from Minsk nearly 120 years ago and no family member had since returned to what was our native homeland. Belarus has been isolated from relations with the United States for a decade, and being of Belarusian decent surely helped to establish trust in such a challenging social and political environment. This project trained roughly 100 pediatricians and 30 medical students about oral health. Prior to departing Belarus at the end of my stay, the faculty wanted to brainstorm and review next steps to expand the work we started. Ideally, the next goal would involve a lecture at the national pediatric conference in Minsk and to explore further opportunities to visit pediatric polyclinics throughout Belarus. This project opened a door of opportunity in Belarus to improve the oral and overall health of their children, which hopefully will have a long-lasting effect.